Friday night, Chris and I went to see the Orioles play the Cincinnati Reds at Camden Yards. It was rumored that the last time the O's and the Reds played in Baltimore was during the 1970 World Series. Baltimore won that World Series. The evening was awesome temperature and humidity-wise. It was 88 degrees and 35 percent humidity to begin the game. The teams were ready to play baseball and it looked like the O's were going to have an easy time with the Reds, jumping out to a 4-0 lead. But nothing comes easy these days and the score became tied in the 6th inning at 4-4 and remained that way until the 12th inning when in addition to the planned fireworks after the game, Derrek Lee hit a walkoff home run leading off the bottom of the inning. 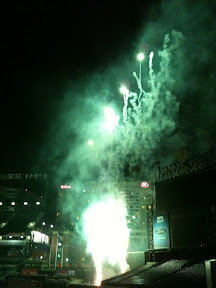 The fireworks were great too and over 45,000 Orioles faithful witnessed a rare extra-inning win. 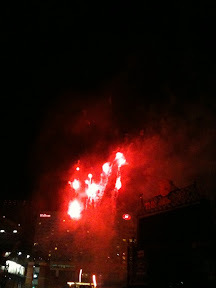 The evening was complete with fireworks on and off the field.